On Saturday, October 6th, Nancy Margolis Gallery hosted an Artist Talk for Drea Cofield moderated by artist and writer, Xico Greenwald. 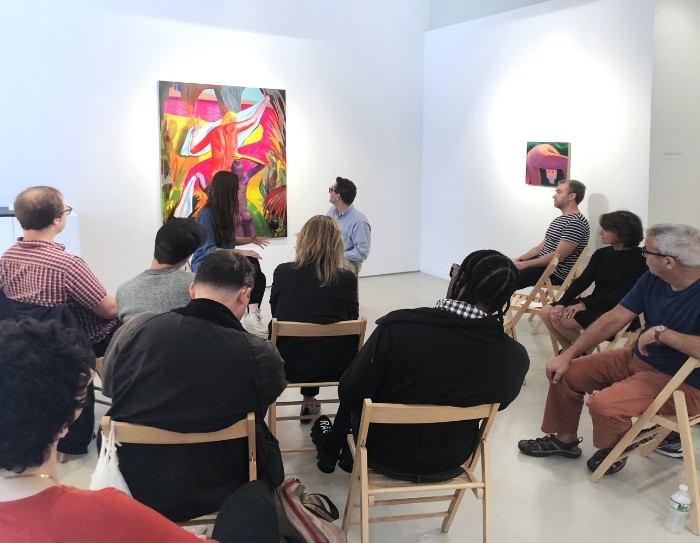 Greenwald engaged the artist in a discussion about her current solo exhibition, Lotus Eaters, and invited questions from the audience. Xico Greenwald is a New York City–based artist. His artwork has been shown at numerous New York galleries, including The Painting Center, Janet Kurnatowski Gallery, Brian Morris Gallery, Thompson Giroux and Life on Mars. He has curated exhibitions at Queens College Art Center, Long Island University’s Selena Gallery and Westbeth Gallery. He has taught at Pratt Institute, Rider University and Mount Gretna School of Art and is currently Assistant Professor at Borough of Manhattan Community College. Greenwald also regularly writes and edits art criticism. His essays, reviews and interviews have been published in The New York Sun, The Epoch Times, artcritical.com, Painting Perceptions and Painters’ Table. Greenwald earned a BA from Bard College and an MFA from Brooklyn College.